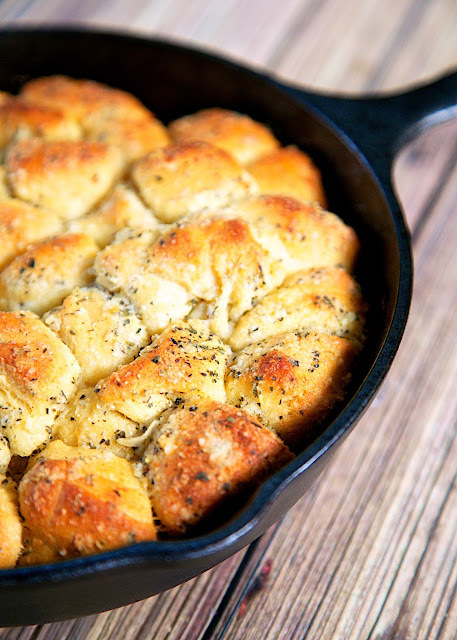 Garlic Parmesan Skillet Bread - refrigerated biscuits chopped and tossed in butter, garlic, italian seasoning and parmesan cheese. Baked in a small iron skillet. Great with pasta. 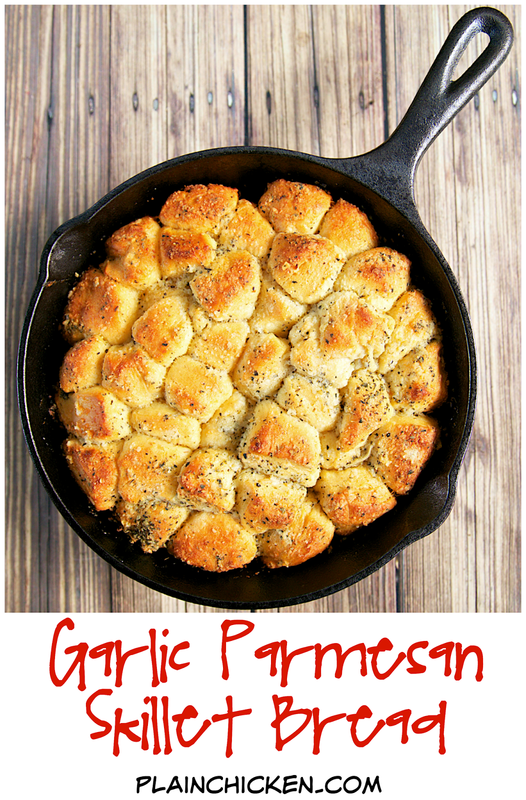 Can also use as an appetizer with some warm pizza sauce. YUM!! I can make a meal out of this yummy bread! 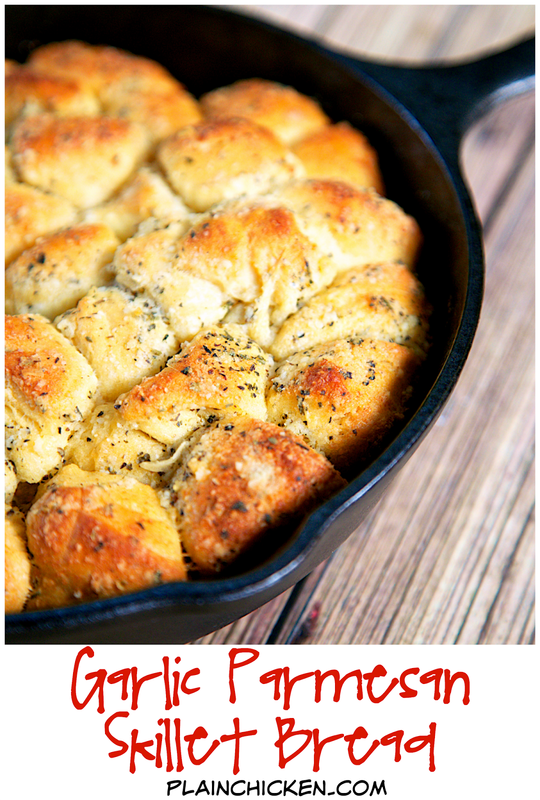 This is one of my favorite bread recipes. It is the perfect accompaniment to a pasta or steak dinner. I am warning you - this bread is highly addictive. It is way too easy to just pull a bite off and pop it into your mouth. You can't eat just one piece. We can almost eat it all between just the two of us. The original recipe came from my long-time "Pampered Chef Lady", Mary. I have changed the recipe over the years. I cut the butter down and added some parmesan cheese. I really love how quick and simple this is. I changed the spices up this time and used the Carrabba's Bread Dip seasoning instead of just Italian seasoning. It was great! Add garlic, parmesan cheese and Italian seasoning. 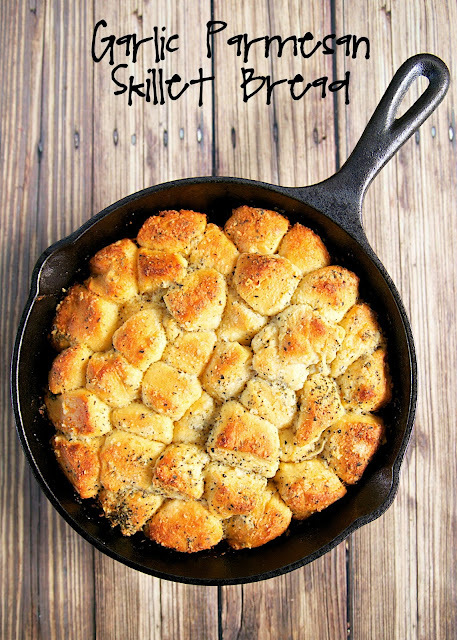 Cut biscuits into quarters and toss in cast iron skillet. Looks great! I can't wait to try it! I LOOOOOVE your blog and recipes! I've already tried a couple and although this will cause me to put on more pounds, so worth it! I cannot wait to try this recipe! Looks pretty easy and sounds good! 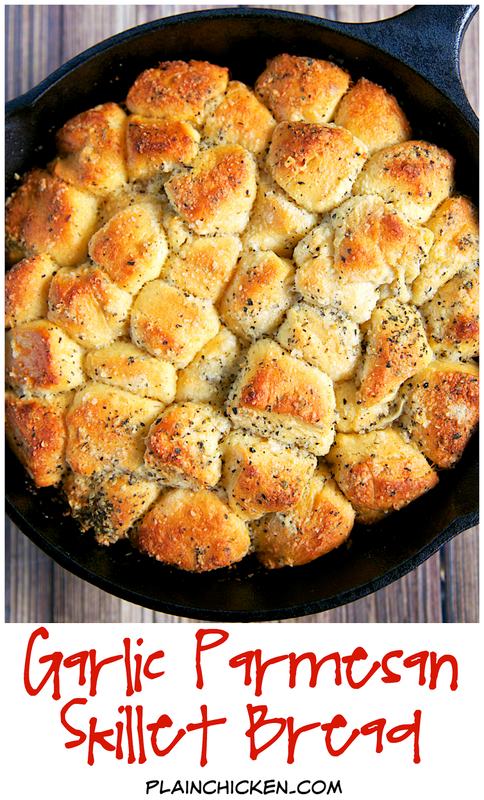 As a lover of all things bread, I simply must make this. It looks delicious! I can see this is going to be very dangerous to my waistline! I can't wait! Oh, I can't wait to give this a try! YUM! Thanks for passing it along. Tried these tonight too! They were so great and easy. They were loved by all. I'm looking forward to experimenting with it, I think a sweet version is in our future! But this is definately going to be a new favorite. This was so easy and delicious! I just posted it on my blog and gave you credit. Thank you so much! Looks and sounds delicious! I am definitely going to give this a try :)! Yum! I just bought a cast iron skillet...perfect recipe to break it in! it looks like delicious.. i love bread.. i will share this post of your..
found you on BJ's post. Anything with cheese is my fave. Copying, printing and makin'! I'm making spaghetti and wanted to use this but don't have parmesan. I have mozzarella - do you think I could use that? This is the 2nd time I made these, first time I made them with spaghetti and this time with homemade chicken noodle soup, yummy these are soooo delicious!! Do you think this could be baked in a bunt cake pan? Are these good leftover? Any tips for storing/reheating? If no cast iron skillet could you double it and do it in a 9x13 pan and would the bake time be the same??? You can make it in 8 or 9-inch cake pan. You can double it in a 9x13-inch pan. I haven't tested the recipe in a 9x13-inch pan, so you will just have to use your best judgement on cooking time. 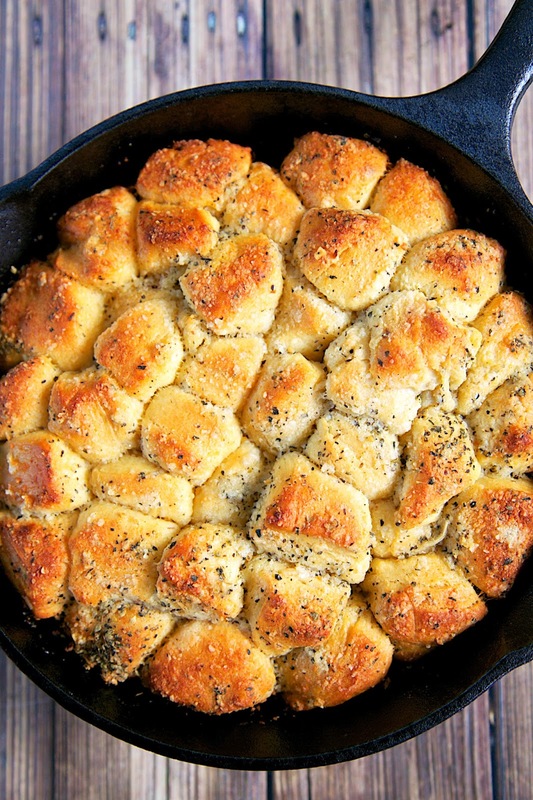 You toss the biscuits around in the skillet to get them coated in the butter and seasonings.